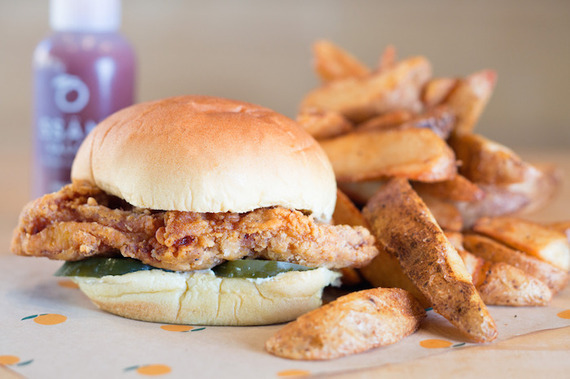 When David Chang first opened Fuku earlier this summer in the East Village, like all establishments from the Momofuku king, the queues were mighty, teeming with New Yorkers clamoring for spicy, crusty, oversized chicken-thigh sandwiches protruding from Martin's potato rolls. Shortly afterwards, a similar buzz pervaded the Brooklyn outposts of Shake Shack, which made its poultry debut on solid burger turf with the ChickenShack, a stellar crunchy sandwich more compact than Fuku's, topped with pickles and a mound of shredded iceberg lettuce. Why'd they do it? Customers were asking for it, according to VP of marketing Edwin Bragg. The Instagram photo announcing the sandwich received the most likes in the history of the company. With cherished Southern fast-food chain Chick-fil-A -- known for both its fried birds and heavy-handed religiosity -- making a significant mark on New York this fall with a large freestanding restaurant in the Penn Station area, it's clear the humble chicken sandwich now permeates regular eating habits. So why the sudden chicken sandwich mania? New York's recent bird takeover offers a portal into a more significant state of culinary affairs: chicken, often passed over for, say, smoky pork and succulent beef, is currently the darling of proteins. Grilled chicken, for example, is often pigeonholed as healthy food, but Hill Country Chicken is transcending that categorization with a new menu of sandwiches flaunting seared chicken thighs in such compelling permutations as chipotle mayo and kale coleslaw or bacon, lettuce and tomato with homemade ranch dressing. Fried chicken's feel-good sense of nostalgia is perhaps to blame for its rampant popularity. But that doesn't mean its preparations have to be limited to fast-food sandwiches. In New York, consider Rob Newton's buttermilk-dressed iteration at low-key Brooklyn hangout Wilma Jean or the rendition served with dried-cherry waffles at expanding chainlet Sweet Chick. Fried Amish chicken with Texas toast is devoured on the patio of Parson's Chicken & Fish in Chicago, while drumsticks lacquered in spicy hot garlic sauce are happy-hour go-tos thanks to the ubiquity of Korean import BonChon. Chef Michael Solomonov puts a Middle Eastern spin (among others) on fried chicken at his Philly institution, Federal Donuts. 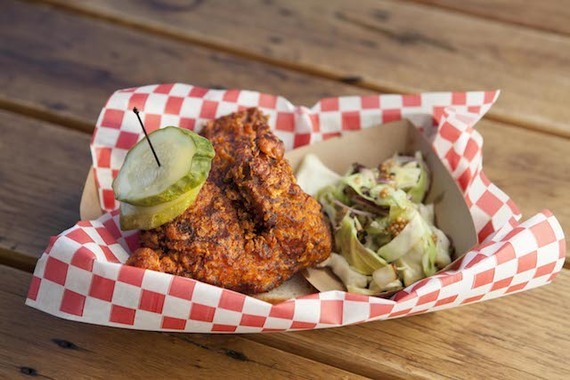 Hot chicken, the Nashville specialty in which fried chicken gets a scorching jolt from a brushing of spicy paste, has now crept above the Mason-Dixon line thanks to restaurants like Leghorn in Chicago, the forthcoming Carla Hall hot chicken concept in Brooklyn, newcomer Southern in St. Louis and even Super Chix, the polished Yum! Brands concept with locations in Dallas and Arlington, Virginia. Even kale-smoothie-guzzling Angelenos are being turned onto the zesty bird thanks to the arrival of Howlin' Ray's, a Venice truck devoted to Nashville's signature dish from husband-and-wife team Johnny Zone and Amanda Chapman. Zone, who first became smitten with hot chicken while staging at Sean Brock's Husk, feels it's a perfect dish. "Every element serves a purpose. Without one, the dish isn't complete. It tastes good, makes people happy and it brings them together. More than anything, it creates memories. If you have hot chicken one time and you smell it again years later, it will instantly transport you. That's powerful. That's perfection," he says. He and Chapman feel the LA crowds are ready for this fiery twist because it is "reminiscent of our childhoods and the beautiful simplicity of those times. With the rise of haute cuisine and the ever-present tasting menu, it's only natural that that we cycle back to where it all began. Chicken is accessible to all of us, regardless of social status. It's something we all know. Elevating a dish you know and love, that's the beauty of chicken." This week the duo roll out their hot chicken in convenient sandwich form to boot. 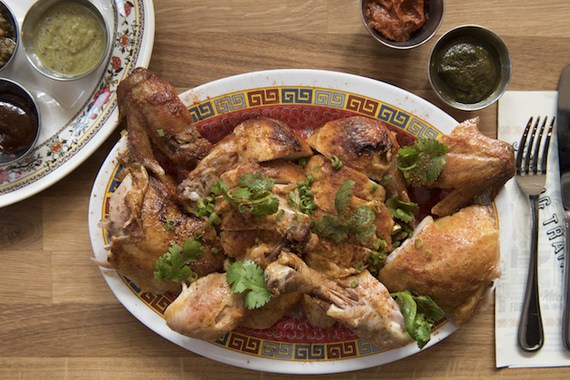 "Chicken got a bad rap in restaurants for being bland and boring, but anything is going to taste like rubber if you overcook it," says Marcus Samuelsson, who recently opened the chicken-focused Streetbird in Harlem. "Now, you have this hunger for authentic flavors and traditions, and for many cultures that road leads to some kind of badass chicken, whether it's fried in a cast-iron pan by your grandma or stewed in berbere to make doro wat. It's a staple in kitchens around the world. You can travel the globe eating great chicken and never have it the same way twice." The image of birds slowly rotating on the rotisserie evokes comfort -- whether at a no-frills Boston Market or a beloved institution like Brasa in Minneapolis. At Streetbird, whole chickens are accompanied by Smokey Q sauce and Auntie Mabel's cornbread. "Chicken makes everybody feel at home," he adds. The full story is over on Zagat! 11 Must-Try Lobster Rolls in the U.S.